Recently, Mark Hardisty has launched a website full of memorabilia in preparation for the launch of his new A Gremlin In The Works book. 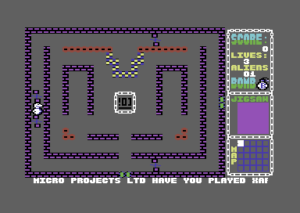 Part of this included source code files which were donated by Anthony J Clarke, which included some C64 source files for two Gremlin Graphics games – Dork’s Dilemma and Tycoon Tex. Hokuto Force have pieced everything together and have made these available for people to check out in an emulation form. Dork’s Dilemma is pretty much the C16 game code and graphics, with no hardware sprites used. It is essentially a complete conversion, but with no sound. 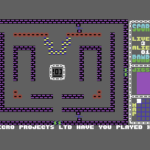 The game was constructed on the C64, and then wired down to the C16 to run and compile. This is why a C64 version of the code was available, which could be compiled to get running – but the intention was always for a C16 only title. Overall, it is a great piece of history preserved thanks to Anthony, Mark Hardisty and Hokuto Force. Check it out! The Game was always intended for the C16… having done a few games on the C64 like Frak64! conversion, Thing on a Spring and Monty on the Run Jason and I saw an opportunity with the C16 launch to develop some games…. I don’t remember the specific setup, but all the coding / assembling was done on the C64, then we had a utility / cable that we would squirt the code to the C16 to run it (I see to recall), latterly we compiled to a Diskette and had a Drive on the C16 we loaded from. What’s the metal barrel it’s hiding in – was meant to be the casing of a bomb! What is that jungle land? – “just a spin on maze’s” the Cassette art was not of my doing, all Gremlin Graphics marketing department – I just sent the game up! Hi, actually… no not “developed” first on a C64…. though we (Jason Perkins and I) had a setup where we developed i.e. coded / assembled then had a piece of software on the C64 C16 that allowed us to Squirt the Code down (or thats how I remember it! – certainly was that way for the Oric Games I developed!)…. in latter days I think we connected a Floppy Drive to the C16/+4….